Scottish Blend Black Tea Original is specially blended for Scottish water, so you always get that fresh clear taste you love. Whether it?s a morning wake up or a bedtime brew, the taste of Scottish Blend tea is sure to hit the spot when you need it most! Our unique Pyramid® teabags act as a mini teapot allowing our finest tea leaves room to move and infuse to give you a great tasting brew, time after time. To enjoy the taste specially blended for Scottish water: Pop your tea bag into hot water and let it brew to your favourite strength, add a splash of milk and sugar if preferred. Scottish Blend is made with tea leaves from Rainforest Alliance Certified Estates. We support our lovely tea farmers, ensuring that they earn just wages, with access to decent housing, medical care and education for their children. 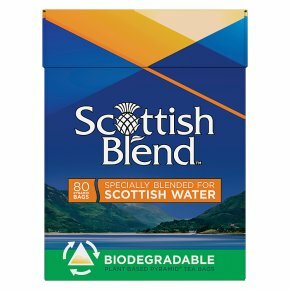 Scottish Blend is specifically blended for Scottish water. This means that you know you?re going to get the fresh clear taste that you?ve come to know and love. Our unique Pyramid® Scottish Blend tea bags act as a mini teapot allowing our finest tea leaves room to move and infuse to give you a great tasting brew, time after time. Whether it?s a morning wake up or a bedtime brew, the taste of Scottish Blend tea is sure to hit the spot when you need it most! At Scottish Blend, we are proud to say that our tea is fully Rainforest Alliance? certified. This means that by choosing Scottish Blend we are together helping to protect the environment whilst ensuring decent working conditions for farm workers and providing access to education and healthcare for them and their families. The best way to enjoy our specially blended tea: Pop your Scottish Blend Pyramid® tea bag into hot water and let it brew to your favourite strength. Add a splash of milk and sugar if preferred. Then sit back and enjoy the taste specially blended for Scottish water! But wait there's more - why not also try our Scottish Blend Loose tea? If you love Scottish Blend, don?t keep it to yourself! Write a review and share your favourite cup of tea with the world. Use 1 bag per cup, add freshly boiled water (100°C) and allow to infuse to your preferred strength.